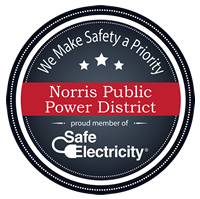 In 2001, Norris Public Power District launched the “Operation Round Up” program. Operation Round Up is a voluntary program that customers sign up for to have their monthly electric bills “rounded up” to the next highest dollar. The additional cents are placed in the Norris Power Goodwill Fund. This fund is administered by a Board of Directors made up of one Norris customer from each of the six counties we serve. The board meets quarterly to consider requests and make disbursements. The Norris District is restricted by state law from using electric revenues to donate to charitable organizations, community projects or social needs. However, we continue to receive numerous requests for donations to worthwhile causes. Participation in the program is strictly voluntary. The average contribution per customer is about 50 cents a month, or six dollars per year. This is perhaps considered small change to the individual, but the thousands of dollars the program generates means a big difference to the people in our six-county service area. Since its inception in 2001, Operation Round Up has granted a total of $889,064 to organizations within our service territory. The funding is used to address crucial needs within the District’s service area. Political campaigns and issues will not be considered for Operation Round Up funds. All applicants interested in receiving a grant from the Operation Round Up Goodwill Fund must complete an application and the corresponding budget form. The Operation Round Up Guidelines, Application and Budget Forms are available at all Norris District offices or you may download and print the Operation Round Up Guidelines, Application and Budget forms here. If you would like additional information on the Operation Round Up program, call 800-858-4707 or visit any Norris area office.